Pope Francis meets with choir members and musicians Nov 24 2018. Credit: Vatican Media CNA. VATICAN CITY: Liturgical and sacred music can be a powerful instrument of evangelisation, because it gives people a glimpse of the beauty of heaven. So said Pope Francis said Saturday at an international meeting of choirs. “Your music and your song are a true instrument of evangelisation insofar as you witness to the profoundness of the Word of God that touches the hearts of people, and allow a celebration of the sacraments, especially of the Holy Eucharist, which makes one sense the beauty of Paradise,” the pope said Nov. 24. 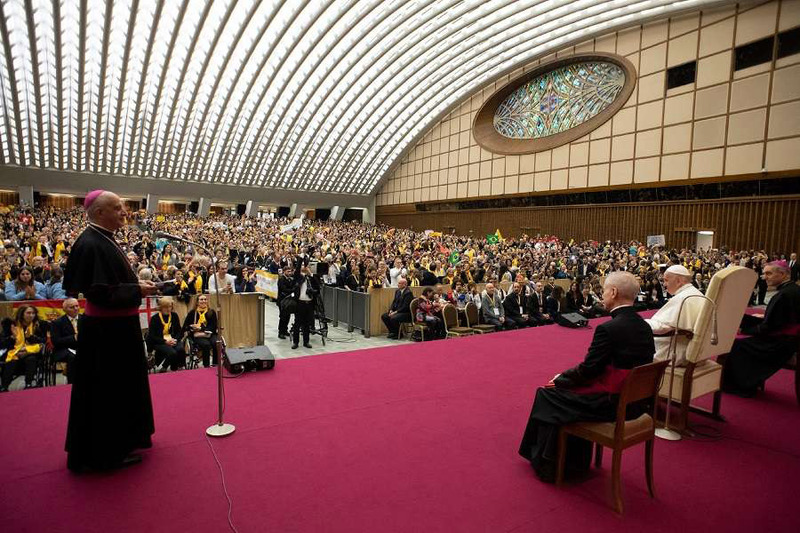 Pope Francis spoke in a meeting with over 8,000 singers and musicians from around the world The performers are attending an international meeting of choirs at the Vatican Nov. 23-25. The third edition of the conference, it began with talks on “Music in the Liturgy and Catechesis for the New Evangelisation,” presented by Msgr. Marco Frisina, a renowned composer and founder and director of the Choir of the Diocese of Rome.